Il gusto incontra il benessere! Proteine di qualità per darti energia nei tuoi mille impegni quotidiani. Do you prefer a healthy, active lifestyle, but cannot imagine your day without a not-so-healthy, unhelpful cup of coffee? We have amazing news for you! New Vita Energy contains a green coffee bean extract well-known for its incredible antioxidant effects. It contains chromogenic acids that help lower blood pressure and monitor weight. 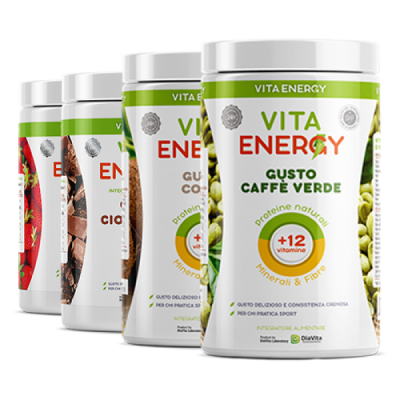 Just replace you everyday coffee with Vita Energy Green Coffee and feel full of power, healthy, and energy! Strawberry flavoured premium smart shake mix contains 75% natural protein for a healthy and balanced life. Strawberries awaken memories of spring and summer. But you can enjoy the treat all year round! 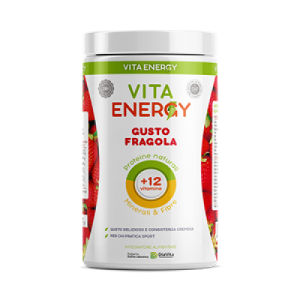 Just try Vita Energy Strawberry shake and you’ll always have a fresh berry treat right by your side.